As a little side project and after reading some of my favourite blogs I decided to do a bit of baking. While I can’t eat sweet, delicious baked goods at the moment, there’s no reason why I can’t make them for others to enjoy. Although yes, I did have two. Only two I swear! And maybe my daughters left over cookie. Rustling up ingredients from the cupboard I found I only had a small amount of milk choc chips left so I decided to also add the rest of my leftover white chocolate milk bits, roughly chopped to add a bit of chunk. 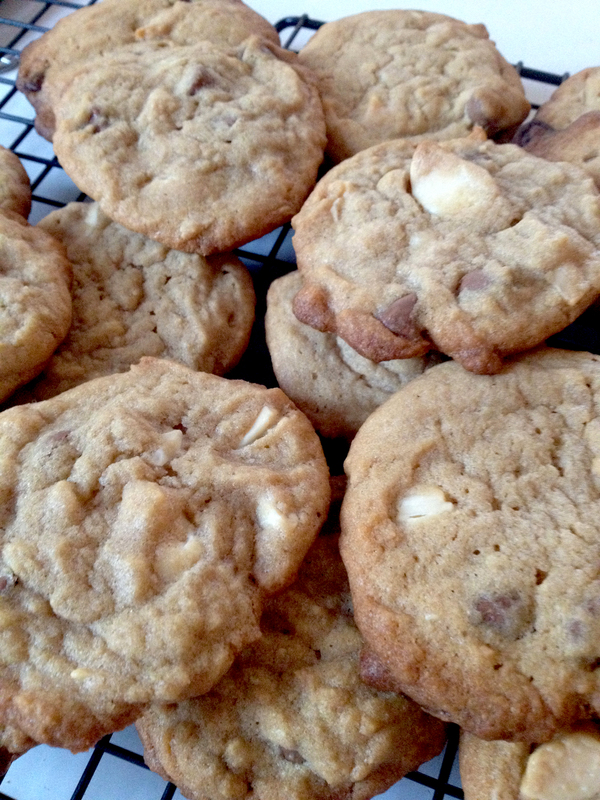 I love chunky, soft cookies and these did not disappoint. I think I should’ve reduced the sugar content a bit due to the white chocolate I added as white choc already contains more sugar than normal choc so they did turn out a little sweet. All in all though, yum! Preheat the oven to 180 degrees C. Place the butter and sugar in a bowl and beat until light and creamy. Add the vanilla and egg and stir to combine. Stir in the sifted flour, baking powder and salt until just combined. Fold through the chocolate chips. Place spoonfuls of the mixture on a lined baking tray. Make sure you leave enough room for spreading as these babies spread! Cook for 15-20 minutes, until they are a light golden colour. Allow to cool on the tray for about 5 minutes before transferring them to a wire rack to cool. You are darling, and now I want some chocolate chip cookies.